There are 2,553 items available. Please enter a number less than or equal to 2,553. I got the item and I am well pleased. Thank You. Fast shipping , Thanks will buy again. Awesome transaction. I highly recommend. A+rating for the seller! Thank You!! Arrived sooner then expected very good quality very happy thank you. Item arrived over five days late. Everthing else okay. Bad Seller, gives bogus Fedex tracking #'s & doesn't ship!! got my money back! This radio is not near the quality of others i have bought from other sellers. Item did not arrive until Dec 15, eight days overdue. FedEx SmartPost TERRIBLE! Cheaply made . Feel like a kids toy !dont recomend! We bought 2 of these and upgraded to the 3.0db gain antennas. They work great if you're within a few miles of the repeater, but don't buy one if you plan on using it further away than that. My brand name 2 meter portable works far better and has LOTS more range than this one. Be sure to add PL tones in the RX to cut down all the interference when you go to a town or city. Not bad for the price, but don't expect to get any semi-distant repeaters. Neat little radio. Need to find an annotated English-language manual on-line to make any sort of use of it. Seller could differentiate themselves from others by providing an electronic copy of the manual or link to one. Appears to be very difficult to program "channels" without a serial connection to a PC and proper software, which I've ordered but not received yet. But the feature set is amazing, mechanical quality appears good (will see how LCD holds up in real world conditions as that's always a weakness with such devices), and price can't be beat. Scanning is a little weak, but it's not sold as a scanner. Main danger is that you could get yourself in a whole big heap of trouble very easily by transmitting on the wrong frequency and/or power level. This is not for the person who just wants to keep track of the kids at the amusement park. As all Baofeng radios, it is tricky but once learned, becomes doable by hand. The trick is that when you push "menu" you scroll through menu items, you must push menu again when the feature you want is displayed. It is sensitive, has great features, and the new battery has good life. For longer range, an aftermarket longer whip can be found online. Make sure it is female, as most Japan radios use a male antenna to match the female socket on the radio. 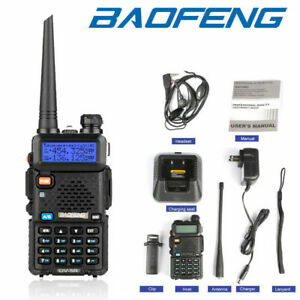 Baofeng, pofang are tbe opposite sense. Programmong repeaters with non standard shifts is tricky too. The is an easy to use software and programming cable available to make it easy and to program multiple radios the same. As retired radio comm systems engr, i am amazed at the wuality for a good price. For ham use you need to buy a repeater guide from the ARRL to find local or other frequencies if you travel. Newbies should grt guidance from local hams as to local ckubd, repeaters, etc. I have several uv5 and 2 uv6. Only trouble wad with a bad bl5 battery which came with thr uv6r. Shorted on receipt. No one sells spare battrries. The first dealer that does will be able to sell a lot. Not in the league of more pricey brand names,as it lacks several basic programming and operational features,such "Memory=VFO, "Scan Channel Lockout", just to name a couple. Programming is cumbersome as it requires many keystrokes to do anything. However, with some patience, you can get it to do most anything you would likely need. Receiver not particularly selective compared to higher cost units. That being said, seems to provide good basic reliable FM 2 way communications. Unit is well built and durable. A very good unit for the low cost.